Photo by Emily Ann Garcia. 2017 Joel R. Workin Scholar! In this 500th year of the Reformation, it strikes me that if LGBTQ+ Christians are to help in the ongoing reformation, then surely Ben’s voice is one that needs to be lifted up. I speak for all the committee when I say we pray that, as a Workin Scholar, Joel’s witness will continue to shine and sparkle in Ben’s life and ministry throughout the years. Ben’s resume illustrates the breadth of his experience, from a commitment to youth, the marginalized, multiple justice issues, and experience outside the Church. Ben’s essay was striking for its elegant prose, thoughtful reasoning, and the ease with which it integrates not only Joel’s writings, but thoughts from Martin Luther and Mother Teresa as well. Each year ELM names a Joel R. Workin Memorial Scholar to honor the life and ministry of Joel Raydon Workin. Joel was one of the three seminarians who were refused ordination in 1989 after coming out to their candidacy committees. Upon his death, Joel’s parents, Ray and Betty, and other family and friends created the scholarship fund in his name to keep his prophetic voice part of the movement. This past November, Betty’s life was honored through many memorial gifts to the Fund after she passed away from cancer. The award comes with a $2,500 scholarship for academic or spiritual study and is available for members of Proclaim who are preparing for rostered leadership in the Lutheran church. I am so sincerely humbled and honored to be the 2017 Joel R. Workin Scholar and am grateful for Joel’s family for carrying on his legacy, as well as the selection committee for this honor, and the ministry of staff of ELM and the Board. Thank you! During my time at PLTS and throughout candidacy, Joel’s words have accompanied me and will continue to impact my ministry. Through his sermons and essays, Joel has become in some ways a saint-mentor and I am so grateful for his witness. It is not lost on me that I am receiving word of this award one year after the Pulse Night Club tragedy. This year has been difficult, especially for the LGBTQ+ community, communities of color, and those with intersectional identities. The anniversary of Pulse allows us to come together to do the hard work of existence, resistance, and persistence. Joel’s words remind us that death will not win, nor keep us from God. ‘God’s love, and I say this by faith and not by fact, is the mightiest thing in all creation and nothing will keep it from us.’ I hold that dear to my heart. 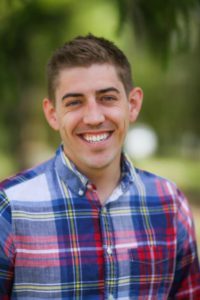 Ben is a candidate for ministry in the Evangelical Lutheran Church in America and a seminarian at Pacific Lutheran Theological Seminary in Berkeley, California. Ben is from Grand Junction, Colorado and graduated from California Lutheran University in 2010 with a degree in Advertising/Public Relations and Sociology. Ben served with Peace Corps Ukraine, in the small village of Kolky from 2010-2013, teaching English, leadership, and country studies, and also helped to organize and run teacher and youth camps. Ben has been an active member of the Proclaim community, attending the annual Gathering, and serving in various capacities, most recently as the Proclaim Seminarian Outreach Team Convener this past year. Ben will be on internship beginning this fall at Lutheran Church of the Reformation in Washington, D.C., where ELM board member Rev. Michael Wilker is lead pastor. Learn more about the Joel R. Workin Endowed Scholarship here. This entry was posted on Thursday, June 15th, 2017 at 5:00 am	and is filed under Blog. You can follow any responses to this entry through the RSS 2.0 feed. Both comments and pings are currently closed.